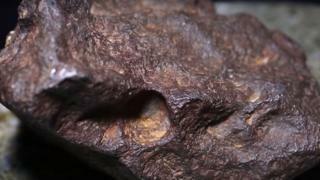 A US professor has established a rock used as a doorstop is actually a meteorite worth thousands of dollars. Mona Sirbescu from Central Michigan University was asked by a local man to inspect the object he had kept for 30 years after finding it on a farm. The rock, which came down on farmland in Edmore, Michigan, in the 1930s, could be worth $100,000 (£77,000). Most meteorites typically consist of approximately 90-95% iron. What makes the meteorite found in Michigan unique is that it is 88% iron and 12% nickel. "A piece of the early solar system literally fell into our hands," Dr Sirbescu said in a video made by the university to promote its discovery. Meanwhile, the university has been using the meteorite as a teaching material. Video Meteor bursting into flames caught on camera.